Goodnight is clearly the progeny of the renowned "Davis," Multi Ch Chelsea Long Kiss Goodnight, FCh, carrying his trademark vigor and vitality. She finished her AKC championship in great style by winning "Best of Winners" at the GSDWA specialty over an entry of more than 75 dogs, second only to our Bette, who took the top prize at the specialty . Goodnight has been bred to handsome Ch Camelot's Nerves of Steel, "Remington," and delivered her first litter of seven in October 2005. Goodnight has been shown by Amanda Clevenger, Pam Lambie and Mary Dukes. 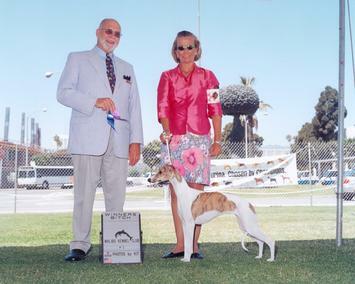 Bred by Susan Vernon, Ann Alexander and Bob Baldridge. Goodnight wins under Judge Lester Mapes, handled by Mary Dukes. Photo Kitten Rodwell. Goodnight's an avid runner and player at Nysa Hill. Photo A Diehl. 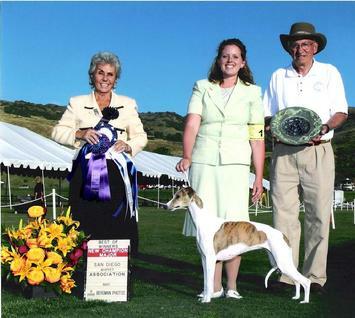 Goodnight finished with a major WB/BOW at the Greater San Diego Whippet Specialty under Judge Quiros. Photo R Bergman. Whippet Female White w Red Brindle. Bred by Ann Alexander, Bob Baldridge & Susan Vernon.